Republican Sen. John Neely Kennedy (La.) waded into the debate over whether the Trump administration should strip the security clearances of several top Obama-era intelligence officials by asserting that some of the individuals under consideration had acted like "buttheads" and "political hacks." 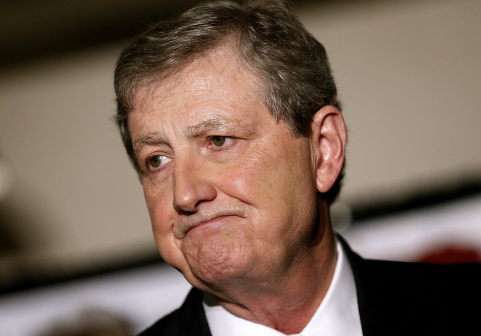 Speaking to The Hill on Tuesday, Kennedy was asked if he supported the proposal, which has drawn consternation and rebuke from Democrats and media figures. The critics have accused the president of attempting to retaliate against his detractors. The senator expressed there was no doubt that former CIA Director John Brennan and former Director of National Intelligence James Clapper, two names floated to have their clearances revoked, have acted more like "political hacks" than "national security professionals" since President Donald Trump took office. "Mr. Brennan and Mr. Clapper are supposed to be national security professionals and they haven't been acting like it," Kennedy said. "They've been acting like political hacks." The Republican elaborated that he was still weighing if the president has the ability to unilaterally rescind a security clearance and whether a clearance can be revoked "for being a butthead." "I'm in the process now of researching both the law and custom and usage in terms of revocation of a security clearance," Kennedy said. "I haven't determined yet whether you can or should revoke somebody's security clearance for being a butthead, but that's what they've acted like." On Monday, White House press secretary Sarah Huckabee Sanders announced the Trump administration was examining stripping the security clearances of several former Obama administration intelligence officials including Clapper, Brennan, ex-National Security Adviser Susan Rice, and Gen. Michael Hayden, a former CIA director and former head of the National Security Agency. Sanders disclosed the president was exploring mechanisms to rescind the clearances because several of the individuals in question had "politicized and in some cases monetized their public service and security clearances." The White House initially also floated revoking the clearances of former Federal Bureau of Investigation (FBI) Director James Comey and his principal deputy, Andrew McCabe. Both men, however, lost such privileges upon being fired. The idea for revocation arose after the president had a conversation with Sen. Rand Paul (R., Ky.), who has long been wary of the national security infrastructure, on Monday. Prior to their meeting, Paul took to social media to disclose he would ask the president to curtail access to "public officials" who "use their security clearances to leverage speaking fees or network talking head fees." Paul specifically pointed out Brennan, a national security and intelligence analyst for NBC News and MSNBC, accusing the former CIA director of "monetizing his security clearance" and "making millions of dollars divulging secrets to the mainstream media." High-ranking intelligence officials generally retain their security clearances after leaving office so they can advise their successors or Congress on sensitive matters. Brennan, who has been a vocal critic of the Trump administration, has stepped up his attacks on the president in the wake of the Helsinki summit between the United States and Russia. The summit, which garnered criticism as a missed opportunity for the president to send a stern signal to Russia about future election meddling, was denounced by Brennan as "nothing short of treasonous." At the time, Kennedy dismissed the former CIA director's claims, stating Brennan "was lost in a sea of dumb and has been" for some time. This entry was posted in Politics and tagged Intelligence, James Clapper, John Brennan, John N. Kennedy, Louisiana, President Trump, Trump Administration. Bookmark the permalink.